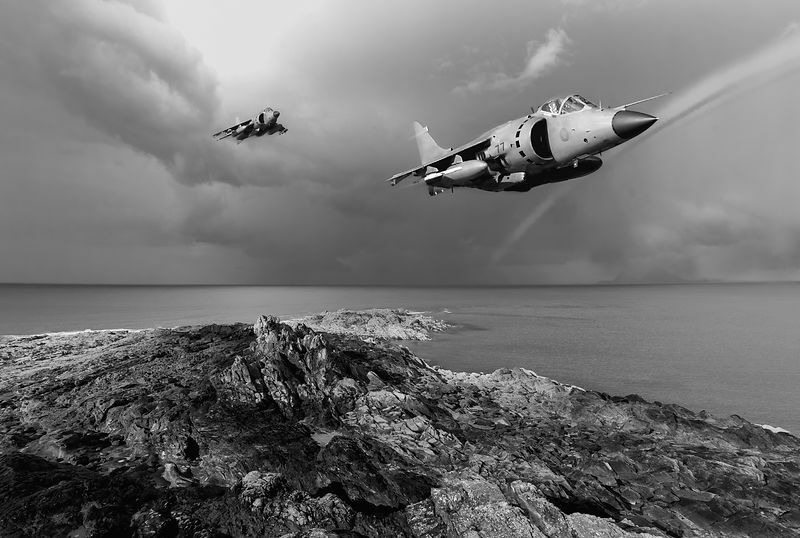 8 June 1982: RAF exchange pilot Flt Lt David Morgan in Sea Harrier FRS1 no ZA177 (77, foreground) shot down two Argentine A-4B Skyhawks of FAA Grupo 5 over Choiseul Sound in East Falkland, and Lt David Smith in XZ499 (99) another, using Sidewinders. David Morgan was later awarded the Distinguished Service Cross for his actions in the Falklands conflict. Digital composition. Read more about the Harrier in my article for BBC News.